Have you been dazzled by whole cloth quilts and wondered how they are created? 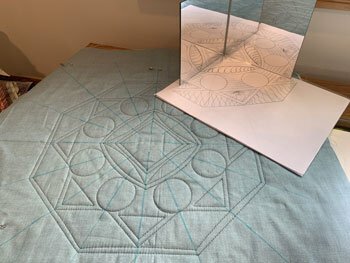 Well, now is your chance to design and stitch your own whole cloth design using your Ruler Work rulers. The morning will be dedicated to design as you create 2 different whole cloth possibilities. In the afternoon you will shift to some easy marking and then stitching out your design. Ruler work experience required. Requirements: Some ruler work experience required.